The perfect Christmas tree for a New York City apartment would be a little bit slimmer than the (scaled-down) footprint of the Flatiron building. A 20-degree isosceles tree would almost be narrow enough for you to wrap your arms around. It would fit comfortably in a corner without obscuring windows, doors, or your Shutterfly selfies. And although its creation would be an excellent business plan (@ me, arbor farmers -- all we need’s the seeds and the land! 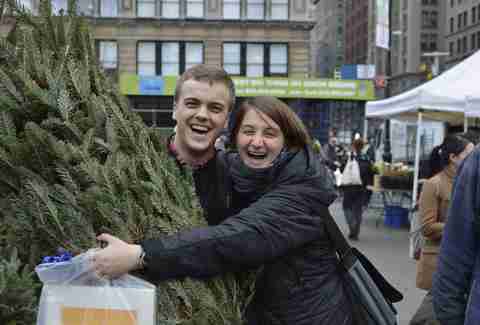 ), this perfect NYC Christmas tree does not yet exist in natural form. Sure, you could order an artificial pencil tree from the comfort of home and avoid the haggling, the heavy lifting, the transportation, the watering, and the eventual decay and disposal -- but what’s merry and bright about convenience? Holiday cheer is better earned than given, and now’s the time to work like an elf eyeing a promotion and find the evergreen fir, pine, or spruce of your sugar-plum dreams. ... Which, as luck would have it, brings us to right about now! Any longer than two weeks before the 25th, and the thing transforms from a treasure perfuming your home to an unused coat rack. Any later and what’s the point? ... Oh, who are we kidding, I’m only saying that to pad the coffers of my burgeoning arbor farm. Everyone celebrates in their own way, and if you want to do it with an artificial tree that surely no one will think is a metaphor for your entire life, go ahead! But you may want to wait until after the holidays when they go on sale. Decorate an unused coat rack in the meantime. ... 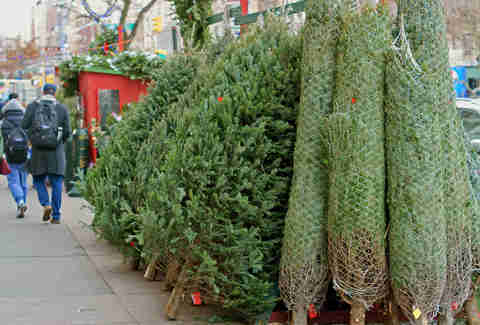 Listen, there are plenty of major retailers that will sell you a serviceable, symmetrical tree for tens of dollars less than the local guys. The big box shops even take credit cards and probably have joy or your money back guarantees. But odds are, they’re far enough from your apartment that you’d need access to a car. Rent one and you’re in this thing for more dollars than you planned. Borrow one and everyone hates you. Do not even try it with an Uber. 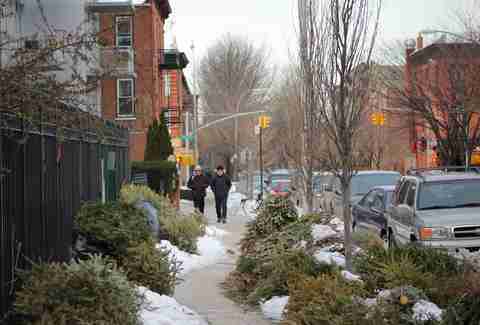 Instead, keep your eyes peeled around your neighborhood for vendors, (most often adjacent to churches or bodegas), pick the place closest to your home, and, depending on your find’s size, walk it home alone or with a friend. 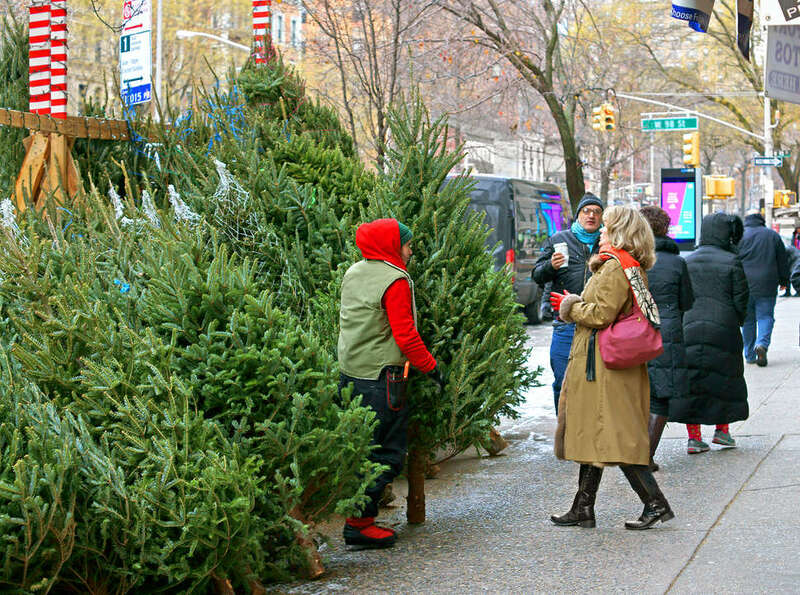 ... Until one woman’s vision of the perfect 20-degree urban tree comes to fruition, you’ll have to evaluate your space and see what you can squeeze in there. Almost every dwelling has a high enough ceiling to accommodate a tall tree, but few spaces have the cubic feet necessary for width. A 6-foot tree could be nearly as wide, and if you’ve got six extra feet of floor space lying around, I’ve got a farm to sell you, Mr. Rockefeller. This is lower stakes than, say, buying a new couch that may not fit through your front door, so it’s OK to trust your eyeballs on this one. ... Your typical Central Casting tree -- a fragrant 6-foot Balsam Fir -- will almost certainly run you more than $50. Add on a stand, a tip, and delivery if you were foolish enough to stray too far from home, and you’re approaching $100. But if you’re flexible with your selection, most vendors will help you find something if you tell them how much you want to spend. ... That’s what the evergreen behemoth is: a big, temporary plant. You can pop an everyday succulent on a windowsill and call it a day. Your Christmas tree requires installation. If it’s taller than about four feet, you will most likely need help getting it through the door, in the stand, and passably straight. Then, you have to keep the fragrant fire hazard watered -- but, being that you waited until two weekends before the holiday to buy, this won’t be a burden for long. ... Like a bottle of gin, a Christmas tree is a temporary investment in hope, made in the spirit of celebration. And it’s understandable to feel a sense of loss when each outlives its usefulness. Mitigate those end-of-season-sads by taking your tree down with the same joy you had when you put it up. Open a new bottle of hope, put on some festive music, and pack those ornaments and string lights in a fashion that next year’s you will be thankful for. Pick up a Christmas tree disposal bag for a few bucks at your (local!) hardware store to lessen the stray needle load, and get that once-beloved shrub to the curb on recycling day for pick-up. Before you know it, it’ll be time to prepare for Christmas, 2019! It starts earlier every year. . .
Amber Sutherland-Namako is Thrillist's New York editor. Follow her on Twitter.